OUR Managing Director Simon Boyd urged politicians to present a united front for Brexit negotiations when he appeared on the BBC’s flagship Any Questions programme. He warned that some politicians were damaging the position of the UK’s negotiators by playing party politics and that some (past and present) were deliberately trying to undermine the process with the aim of keeping us in the EU. 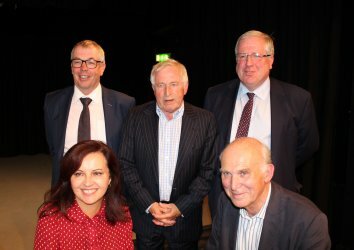 Mr Boyd, who is managing director of Christchurch-based REIDsteel, appeared on the Radio 4 programme in Dorchester with Lib Dem leader Sir Vince Cable, Labour MP Caroline Flint and Conservative Party chairman Sir Patrick McLoughlin. He sparked a lively debate when he insisted that Brexit could not come quickly enough and that the UK must be prepared to walk away without a deal. Simon, speaking after the broadcast, said: “I was trying to get across how important it is for politicians of every persuasion to support the Government in trying to get the best deal for the UK. “Some politicians are playing party politics and sabotaging our negotiating position. In any business negotiations you have to be prepared to walk away from a punitive deal. Simon reminded the 450-strong audience of the growing £1.7trillion national debt and the UK’s enourmous trading deficit with the EU. He added: “There is a great prize to be won with great trading opportunities for business in third world countries, the Middle East and Far East to name but a few. Simon’s s comments come amid renewed political chaos sparked by Foreign Secretary Boris Johnson ahead of PM Theresa May’s Brexit speech in Italy on Friday. Mr Boyd, who wrote to all 650 MPs earlier this year urging them to back a clean Brexit, said: “This new chaos is only going to encourage EU neogtiators to take a harder line. “Our politicians must get their houses in order and I would urge Mrs May to not make further concessions which would weaken our position.